If anything, the Gezi Protests are a final proof to foreign governments of the AKP’s pragmatic approach to politics. One picture that gives away this pragmatism is the liberal- democratic rhetoric of the AKP on the issue of “deepening democracy”, which has accompanied micro-level infringements on civil liberties. Neddless to say, the party rhetoric is completely at odds with on-the-ground examples. To give a short summary, AKP’s party program utilises terms like pluralism, multi-culturalism, culture of tolerance, culture of consensus, governance, dialogue, inclusiveness etc. and states, “Our pluralistic and freedoms based democracy understanding requires the construction of foundations that allow individuals and all segments of society to express themselves freely in all matters”. It further states that “the AKP denounces understandings that place limitations on freedoms in light of security considerations.” Taken on its own, the AKP’s party program is picture perfect. It is the most egalitarean, human rights based and Eurocentric party programme that has been employed in Turkey’s policitcal history. Nevertheless, from the offset, every response Recep Tayyip Erdogan has made in response to the protests have been to delegitimise the protesters as a group seeking extra political methods – calling them radicals, marginals and finally settling on terrorists – to topple a democratically elected government. He has backed up this belief in a provocative and polarising manner by repeatedly pointing towards a minimalist- Schumpeterean democratic understanding. His message has been clear: “the will of the people is reflected at the ballot box”. His tone is unapolgetic, self-rightious, uncompromising and tutelary. Although Erdogan states that he is the PM of the whole nation, his rhetoric that divides the 50% that voted for the AKP from the rest is striking. Rhetorical tools like referring to the deceased police officer as a ‘maryr’ as opposed to ‘killed’ protesters, ‘drunkerd’ atheist who chew under their heels the values of “his” pious muslims, the treatment of protesters voicing concerns over individual freedoms as illegitimate marginals, or stating the exact opposite of what the eyes testify in rallies where he adresses his own constituency are all damaging. Moving one step beyond the rhetoric, consider this picture: On the one hand you have a group of protesters not only in Taksim but across the whole country. This group is tear gassed, water cannoned, beaten with battons and stripped of their constitutional right to protest. In order to intimidate and put an end to social unrest, the protesters are labelled as “marginals” where Deputy PM Arinc goes as far as stating, “groups attempting to reach Taksim will be treated as terrorists”. 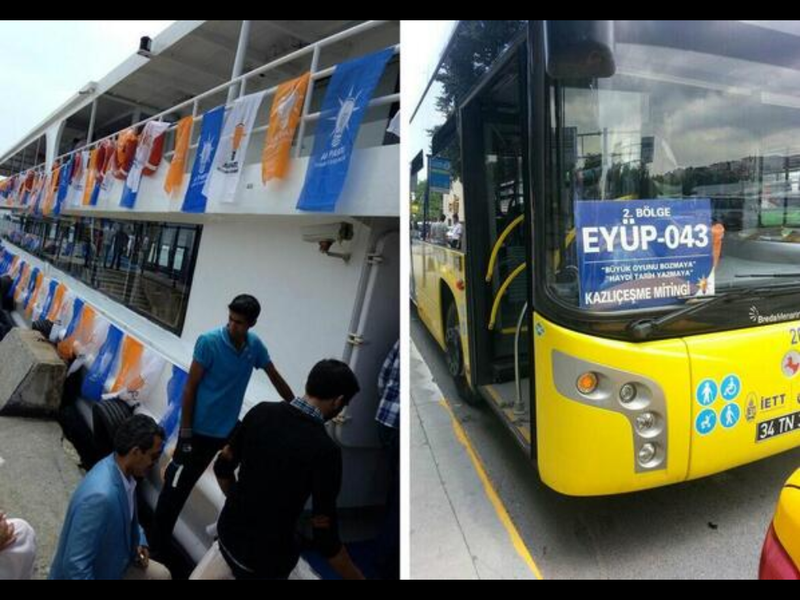 Roads that lead to Taksim are blocked, underground trains, specific roads and ferry routes are temporarily closed. Twitter feeds that are critical are investigated, leading to arrests and further encroaching laws. 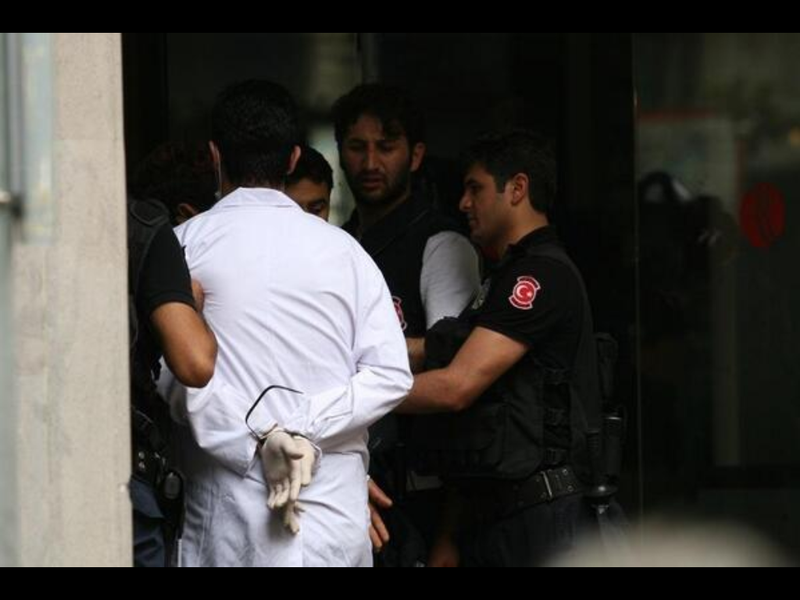 Worst of all, doctors are arrested for treating protesters injured by the police forces. Divan Hotel lobby (15th June). Divan was used as a medical centre during the Gezi Protests. 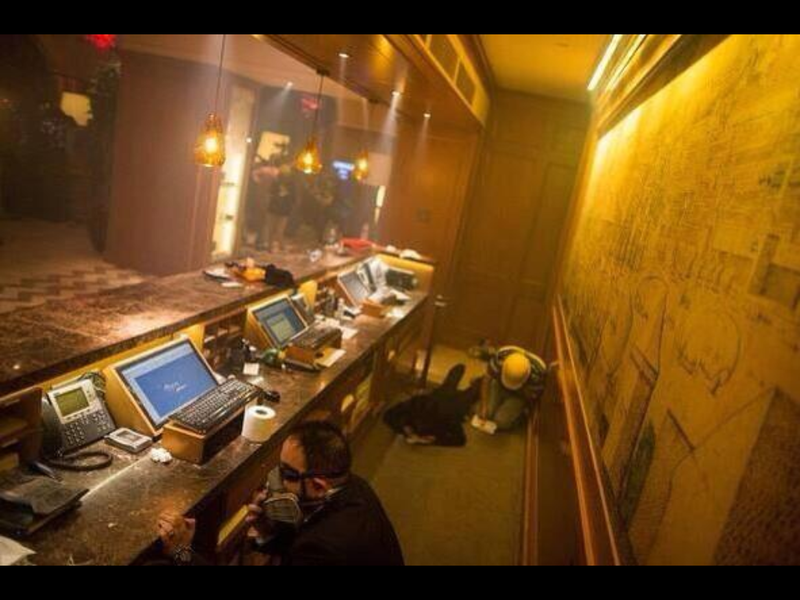 During the Police’s move to take the park, many were forced to flee into the hotel. Evidently, the police did not refrain from going in with gas canisters blazing. *those very same black police jeeps shot rubber bullets at me on 15th June but merely warn the crowd chanting “Recep Tayip Erdogan”. Needless to say, the contrast between the stated ideology of the party on the meaning behind democracy does not match waves of statements made by Erdogan who professes to interpret democracy as an electoral mechanism voicing the “will of the people” (singular) or the line of action followed since the beginning of the protests. Within Western societies, the deficiencies of formal (electoral) democracy as a model of government has been interpreted as the underpinning rationale behind the general public’s entrenched disenchantment and overt distrust of politics and political mechanisms. The term ‘Crisis of Democracy’ can be seen as the symptom which has led academics to articulate alternative models of democracy that can support the electoral machanism. It is in this light that deliberative and radical models critique liberal democracy and aim to re-angage with the public on matters that have a direct impact on the politics of daily life. At its core, radical democracy states the necessity in achieving agonistic pluralism for democracies to function. That is, within the current make-up of societies, it is quite often impossible to transcend antagonism (oppositionary logics). To give an example, secular vs. religious, Sunni vs Alevi, Turkish vs. Kurdish ethnic identities can not be transcended. Under such realities, what is more important is to convert such antagonisms into agonisms. This requires one group to approach the other not as an enemy, but as an adversary. Although this is easier said than done, the Gezi Park protests provide a glimpse of steps in the right direction. It must be stated that inner divisions within the totality of the Gezi protests have been observable. For example, chants of ‘we are Mustafa Kemal’s soldiers” have not sat well with many protesters of Kurdish origin, or by those like myself who do not associate with any of the ‘ists’. Conversely, BDP flags have been torn down from poles by nationalist protesters. Nevertheless, the central feature of the protests which has been against the encroachment of the government into the private choices of citizens has created a sense of solidarity. Thus, the most disappointing development during the protests has been the ill-timed and brutal intervention of the Police Forces into Gezi Park on Saturday (16th June) evening, only hours after splinter groups within the protest movement had agreed to put down their own consecutive tents and bases and to congregate under one unified roof. The overall atmosphere of the protests are peaceful and it was a first in the country’s history that a civil movement included every segment of society including Turks, Kurds, Armenians; Muslims and Alevis; LBGT groups and many more. Against all the odds and the destitute state of events, the solidarity of all groups and their willingness to cooperate is great to witness. Within the Turkish experience, this is not an easy lesson to learn… Thus, along with all the bad, we should see a glimpse of hope for days to come.